Product prices and availability are accurate as of 2019-03-23 02:05:14 EDT and are subject to change. Any price and availability information displayed on http://www.amazon.com/ at the time of purchase will apply to the purchase of this product. Zone: 3 to 8 Growth Rate: Fast to Moderate Plant Type: Deciduous Fruiting Tree Family: Rosaceae Height: 12 to 20 feet Spread: 12 to 20 feet Shape: Rounded Bloom Time: April-May Bloom Color: White Harvest Time: October Sun: Full Sun Fall Color: Golden Yellow Drought Tolerance: Moderate Water: Medium Maintenance: Low Site Requirements /Soil Tolerances: Best grown in loamy, medium moisture, well-drained, acidic soil in full sun. Adapts to a wide range of soils. Culture: Fertilize in spring just before new growth begins. Prune damaged, diseased, dead or rubbing branches. Remove suckers in early summer. Stake newly planted trees. Protect the fruit from birds. Note: Get the best apples by harvesting a tree in 2 or 3 waves. The outside fruit ripens earlier than that in the center of the tree. Also thin heavily when fruit is very young. 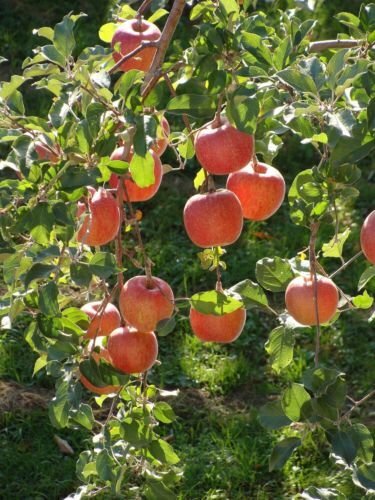 Uses: Espalier, orchard, lawn tree, patio tree, in the foreground of borders, or closely planted in rows, as high screens. Red Delicious Apple, Malus pumila "Red Delicious", Tree Seeds Hardy, Adaptable, Easy to Grow, Fast Growth, Bonsai, Espalier, Fragrant Flowers, Fall Colors, Edible Fruits, Attracts Birds, Wildlife Food/Shelter, Cold, Drought and Wind Tolerant Red Delicious Apple is one of the better known apple varieties. It is a vigorous, productive tree that produces medium to large fruit. Good for eating, but not cooking, this crisp and juicy apple has a waxy red skin with pure white sweet flesh. Its distinctive, delicious flavor makes it a best seller at world-wide markets. Red Delicious Apple was developed in 1870 from seedling rootstock after a scion had broken off on Jesse Hiatt's farm in Peru, Iowa. It was originally named Hawkeye but renamed when one of the commercially known Stark brothers bit into one and exclaimed "My, that's delicious!" Red Delicious Apple is a high chill apple. It requires 800 chilling hours required for fruit to set. Fruit ripens in fall. 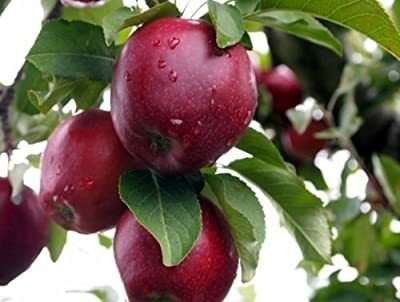 Apple trees have a greater yield if two or more varieties are available for cross pollination. Red Delicious Apple is a good pollinator for almost all other apples.